The TMH Systems Group provides solution-based products that significantly reduce the cost and increase the efficiency of your operations. Choose a category below to view our products. We carry a variety of narrow aisle trucks including the Bendi Electric Narrow Aisle Truck, the Bendi Internal Combustion truck, and the Bendi Model. We have something to fit your Narrow Aisle needs. Find out details on all our Narrow Aisle Trucks today! DYNACO offers 15 highly-specialized doors for a variety of industries including: automotive, clean room, industrial, freezer and food preparation. DYNACO doors offer superior sealing qualities, weather-resistance and realign automatically after being dislodged. 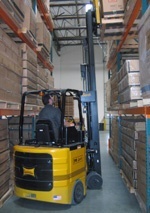 The Hanel Rotomat system has revolutionized warehousing, materials handling and retrieval times. Storage capacity is increased up to 60%, and enormous reductions in work-time achieved. Our Dock systems will surely impress! We carry Dock levelers, Dock Seals, Dock Safety Equipment and Doc Shelters for all your Dock needs. Take a look to see how our Dock systems can improve your warehouse today! Roll formed selective pallet rack system is the most popular and versatile pallet rack in the industry, providing efficient use of space and immediate access to every load stored. Racks are available in structural steel ideal for food handling environments! Interested in our warehouse products?